When I teach a color workshop the participants are asked to paint a color strip of the colors they see of something in nature that they plan to paint. This exercise gives them an opportunity to learn to mix their colors more effectively (without muddying them up). They also learn how to make beautiful neutrals as well as seeing how the sky reflects on the surfaces in the light and dark areas. In the image below you can see we use a double primary palette. When painting the landscape, there are so many different greens and yet... no green on the palette. What do you do? Green and Blue make blue-green. However, which yellow, which blue, do you add any red? I hear these questions at each workshop and students play with the different warm and cool yellows, blues and even learn how to add some red to make a variety of greens. Isolate what you are looking out with a viewfinder or like me, the hole in your palette. I've put a Titanium White, Hansa Yellow Light, Cadmium Yellow Medium, Napthol Red, Quinadrone Red, Pthalo Blue and Ultramarine Blue on the palette. A prismatic palette was taught to me by John Phillip Osborne at the Ridgewood Art Institute in the early 2000's which I am happy to pass on. Osborne was taught by his teacher Arthur Maynard and his teacher was Frank Vincent DuMond. According to Wikipedia, DuMond… "From 1884 to 1888, he attended the Art Students League of New York, studying under Carroll Beckwith and William Sartain. DuMond financed his art education by taking a job creating illustrations for New York's Daily Graphicnewspaper. As a result of his fine work there, he was offered a job at Harper's Weekly. He also later did work for such magazines as Century, McClure's, and Scribner's. He moved to Paris to continue his studies. From 1888 or 1889 to 1891 he attended Académie Julian, where his instructors included Benjamin Constant, Jules Joseph Lefebvre, and Gustav Boulanger. He attained recognition in 1890 when a painting of his, Holy Family, exhibited at the Salon, was awarded a prestigious medal." My weekly trips to study with John Osborne assisted me in learning first to improve my portraits skills, working exclusively from life, seeing the different light and the entire rainbow fall across the face. This rainbow also falls across everything we see. I love sharing how to see this with students in the workshops and classes. For more info join my newsletter list. Click here for more information about workshops. As we progress in the exercise, participants mix up the colors they see using both the warm and cool primary colors to mix secondary variations. We look for the reflections of the sky, how it affects the colors and add the complimentary colors to create beautiful neutrals. 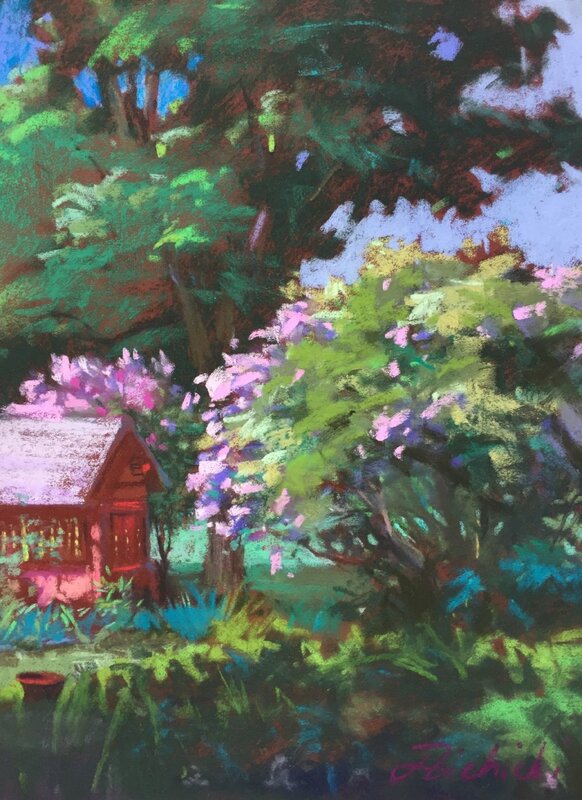 A pastel from the early 2000's still in my collection is a sample of what I was learning when working with a nine step value scale, prismatic color and capturing the greens in nature.